So here's a little observation for how political discussions on the non-politician blogosphere end up in, my view. 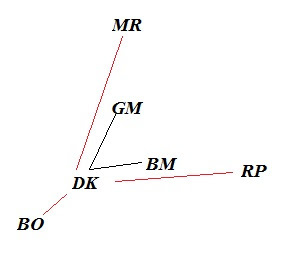 In the diagram below, DK is me, BM is Bob Murphy, GM is Greg Mankiw, MR is Mitt Romney, RP is Ron Paul, and BO is Barack Obama. There's no reason to choose Bob or Greg except that they are convenient examples of people who seem to feel for Paul and Romney about what I feel for Obama. I think DK is the truth point. I really have no other choice. I can attach a certain degree of certainty to my views, but I have no choice but to believe they are true. Why would you hold a view you believe is wrong? So everyone gets assessed relative to the truth point as I see it. On average, non-politicians are closer in on the truth point than politicians. Barack Obama is off the truth point. Clearly. He's a politician. But most importantly he's not me. There are only a couple people approaching being as close to the truth point as me and it's certainly not going to be a guy that thinks spending all year grubbing for votes is a good use of his time. The thing to remember is that everyone is in my position. Bob also thinks non-politicians - people who sit around and think about this stuff rather than manipulate to gain office - have a better grasp on things than politicians too. But for him Ron Paul is pretty good as politicians go. But still not great. Same with Greg Mankiw and Mitt Romney. The problem is that Bob Murphy sees me defending a politician when he knows that politicians are far from the truth point, particularly that one. I'm defending Obama because I see him as approximating the truth, but that seems implausible to Bob Murphy, who has his own truth point. I'm sure most of this is subconscious, because Bob probably knows that I think Obama approximates the truth imperfectly. But subconsciously that seems so implausible that Bob has to wonder: does Daniel not see that politicians, as a group, are on average way off the truth point? He wonders if I miss this fundamental point. He wonders if my thinking has been obscured by ideology or partisanship. And I - subconsciously - wonder that about him too. And let's face it, we all sometimes wonder that about Greg. I think this sort of process generates a lot of second guessing and motive questioning than is optimal. What's more is that I'm not sure that the situation necessarily improves as the DK, GM, and BM points move closer together unless there are some really eccentric politicians in the mix. I guess what sometimes aggravates me about you, is that it seems you go way out of your way to defend something that Obama (or Krugman) said/wrote, which strikes me as very implausible. I.e. someone will say, "Obama/Krugman said X, what an idiot/jerk!" Then you say, "Clearly what Obama/Krugman meant was Y." And often I think no, they meant X.